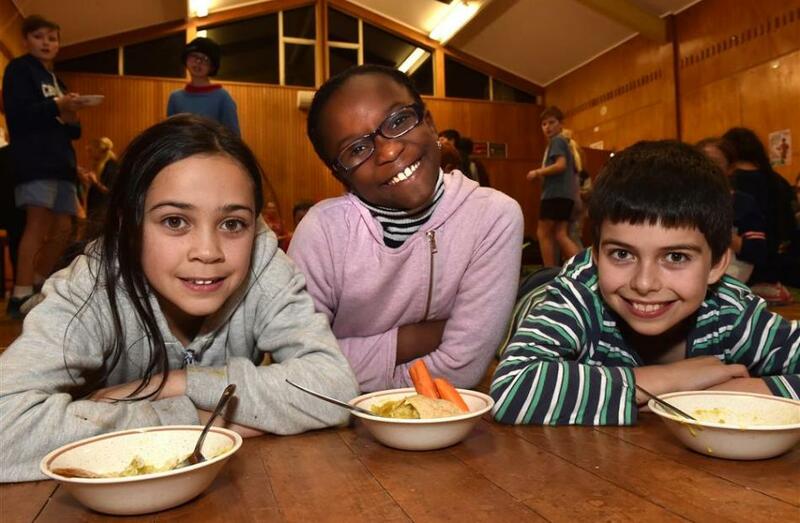 Liberton Christian School pupils (from left) Bethany Pantel (9), Malaika Ogebuehi (10) and Daniel Bretz (10) enjoy lentil dahl, carrots and rice – the type of food Syrian refugees might eat at refugee camps in Jordan. For the first time in 41 years, the focus of the annual 40 Hour Famine has changed to 40 Hours for Refugee Children, putting the spotlight on the Syrian crisis – the biggest humanitarian crisis of recent times. Liberton Christian School ran a sleep-over, simulating a refugee camp, at the school last night. Principal Fiona Sizemore said about 40 pupils participated in the event, which they hoped would raise about $5000 for World Vision. If the school was successful in its bid, the money would help furnish and provide resources for two classrooms at one of the refugee camps in Jordan, she said.